The response of Meishan conceptuses to an exogenous precursor for oestradiol-17β biosynthesis was investigated in vitro, to determine whether gestational age or morphological stage of development elicit changes in hormone metabolism. Conceptuses were recovered on days 11, 12, 13 or 15 after the onset of oestrus and cultured for 6 hours at 37°C, in the presence or absence of testosterone. On days 12 and 13 after the onset of oestrus spherical conceptuses were recovered from some gilts, whereas others yielded elongated or filamentous conceptuses. All conceptuses recovered on day 15 after oestrus had elongated. The number of cells per individual conceptus increased from days 11 to 13 after the onset of oestrus (P < 0.001), as did conceptus surface area (P = 0.038). Supplementing culture media with testosterone, as a substrate for oestrogen biosynthesis, significantly increased conceptus oestradiol-17β secretion in vitro on days 12, 13 and 15, regardless of whether pre- or post-elongation conceptuses were cultured. However, on day 11 oestradiol-17β was only detected at significant concentrations in the culture media of four testosterone supplemented conceptuses and only one gilt produced conceptuses capable of secreting oestradiol-17β in the absence of testosterone. Therefore, the onset of conceptus oestradiol-17β secretion is apparently limited by the expression of aromatase enzymes that are activated synchronously, irrespective of the stage of morphological development, within Meishan litters. Once established, Meishan conceptus oestradiol-17β secretion in vitro is increased in the presence of exogenous testosterone. Conceptus mortality within domestic pig breeds is a significant limiting factor for the efficiency of commercial pig production in developed countries . Therefore, understanding the mechanisms by which Meishan pigs achieve their increased prenatal survival at a given ovulation rate , may help in the development of strategies to overcome this problem. Conceptus survival rates by day 23 of pregnancy in Meishan pigs exceed those of domestic breeds , but no breed differences in conceptus survival before day 11 of gestation have been observed [4–8]. Furthermore, the domestic breeds do not appear to show additional conceptus mortality between days 23 and 30 of gestation . Collectively, the above observations suggest that critical events for conceptus survival occur between days 12 and 23 of gestation. During this period acute biochemical and morphological changes occur in the conceptuses; they attach to the wall of the uterus and luteolysis is overcome, resulting in the establishment of pregnancy. Insufficiencies in any of these processes will compromise conceptus survival. Conceptus oestradiol-17β secretion is believed to be responsible for the establishment of pregnancy in domestic pig breeds . Exogenous oestrogens extend the oestrous cycle of the Meishan , suggesting that a similar mechanism operates for this breed. In Large White x Landrace gilts, considerable conceptus loss occurs coincident with the onset of conceptus oestradiol-17β secretion and the maintenance of the corpora lutea. However, Meishan conceptus survival remains high during this period , when differences in conceptus oestradiol-17β content between Meishan and Yorkshire sows have been reported . Preliminary studies have indicated that Meishan conceptuses differ from Large White x Landrace conceptuses in their time of onset of oestradiol-17β secretion . The purpose of this study was, therefore, to investigate this observation in more detail. Testosterone, a precursor for oestradiol-17β biosynthesis, is present in the uterine luminal fluid of pregnant domestic gilts at higher concentrations than in cyclic gilts between days 9 and 15 after oestrus . Furthermore, cytochrome P450 aromatase (aromatase), a microsomal enzyme which converts testosterone to oestradiol-17β, is known to be present in blastocysts of domestic pigs during the period investigated in this study [14–19]. This study aims to test the hypothesis that oestradiol-17β biosynthesis in Meishan conceptuses occurs independently of morphological stage of development. If this hypothesis is true, we predict that Meishan conceptuses will be biochemically synchronised within a litter, and will commence oestradiol-17β secretion at a specific time after the onset of oestrus, regardless of their individual morphology. We propose to resolve whether enzyme activity or substrate availability controls this event in Meishan conceptuses, by using testosterone as an exogenous precursor for oestradiol-17β biosynthesis by aromatase in vitro, during the period of the establishment of pregnancy. Two-month old, prepubertal, purebred Meishan gilts (N = 18) were supplied by Cotswold Pig Development Co., Rothwell, Lincolnshire, UK. They were individually penned for at least four weeks before the expected onset of puberty and observed once daily for oestrus behaviour using intact Meishan boars. Natural insemination by two different Meishan boars at their sixth observed oestrus after puberty occurred on the first day of standing heat (day 0) and 24 hours later. The gilts were assigned for surgical conceptus recovery on days 11, 12 or 13 after first mating (N = 6 gilts per day). At the second oestrus after surgery (eighth oestrus after puberty) a random subset of the gilts (N = 5) were mated as described above. On day 15, conceptuses were recovered from these gilts post mortem. These four days were chosen to encompass the time when pregnancy is established. All experimental procedures were carried out within the scope of the UK Animals (Scientific Procedures) Act, 1986. Day 11, 12 and 13 conceptuses were recovered surgically via mid-ventral laparotomy under deep anaesthesia, induced by inhalation of a mixture of halothane and nitrous oxide. Ovulation rate was estimated by counting the number of corpora lutea visible on the surface of each ovary. Each uterine horn was irrigated with 30 ml 0.9% (w/v) sterile sodium chloride (Aqupharm 1, Animalcare Ltd., York, Yorkshire, UK) to collect the conceptus tissue. Uterine contents were recovered by inserting a 5 mm external diameter, sterile, flexible PVC cannula that was approximately 15 cm in length, 1–2 cm into the uterine lumen via a puncture wound close to the utero-tubal junction . Day 15 conceptuses were recovered post mortem, following exsanguination under deep anaesthesia. The reproductive tract was removed and processed under aseptic conditions. The uterus was irrigated, as described above, and ovulation rate determined by counting corpora lutea visible on the ovaries. Upon recovery from the uterus, blastocysts were allocated into one of three discrete morphological classes: individually identifiable microscopic blastocysts (<1 mm diameter); individually identifiable macroscopic blastocysts (>1 mm diameter) or entangled, elongating blastocysts, which could not be separated into individual embryos. Litters of individual blastocysts were equally distributed into two groups (control or testosterone treatment), such that each group contained embryos representing the full range of morphological stages observed in that litter. Those conceptuses visible to the naked eye were measured in two dimensions using 1 mm graph paper, and their surface area (mm2) estimated. Conceptuses visible only under the microscope were not measured. Each blastocyst was cultured individually in 1.5 ml Minimum Essential Medium (MEM; Life Technologies Ltd., Paisley, Scotland, UK). For litters in which blastocyst elongation had commenced, cultures containing a similar mass of mixed conceptus tissue, between 0.050 g and 0.100 g (wet weight) per dish, were prepared and cultured in 3 ml MEM. The cultures were once again divided into two groups, for controls or for testosterone treatment. Testosterone (4-Androsten-17β-ol-3-one, γ-irradiated, sterile, Sigma Chemical Co., Poole, Dorset, UK; 2 μg ml-1 MEM) was added to each of the cultures in the testosterone treatment groups. This concentration was based on that used in a comparable experiment using Yorkshire x Duroc x Hampshire domestic gilts . Both control and testosterone treated cultures were then incubated in the dark at +37°C in a controlled atmosphere chamber . The chamber was filled with 47.5% O2, 50% N2 and 2.5% CO2 (medical grade gases) at the beginning of the culture period. After six hours the cultures were terminated, since the rate of porcine conceptus oestradiol-17β secretion decreases after six hours in culture . Conceptus tissue and culture media were separated by centrifugation at 3000 × g for approximately 2 minutes. The culture medium was aspirated and stored at -20°C until assayed for oestradiol-17β concentration. Pelleted conceptus tissue was resuspended in 1 ml sterile phosphate-buffered saline and stored at -20°C for DNA analysis. The oestradiol-17β content of the conceptus culture media was determined in duplicate without prior extraction [23, 24]. Standards ranging between 7.5 and 3000 pg ml-1 oestradiol-17β (β-estradiol, Sigma Chemical Co., Poole, Dorset, UK, 100 μl per tube) were prepared in triplicate and charcoal-dextran suspension was used to separate the bound and free steroid. The minimum detectable dose of the assay was less than 7.5 pg ml-1, and the mean intra-assay coefficient of variation was 8.83%. Quality control samples containing 1770 ± 40 pg ml-1, 161 ± 3 pg ml-1 and 21.2 ± 0.8 pg ml-1 oestradiol-17β were used to calculate the inter-assay coefficients of variation, which were 12.41%, 9.33% and 16.49%, respectively. Media containing testosterone at the same concentration as used in the conceptus cultures had a significant, but constant, cross reactivity with the antiserum used in the oestradiol-17β radioimmunoassay. Media lacking supplemental testosterone, as used in the control cultures, registered values less than the minimum detectable dose of the assay. Therefore, the constant value was subtracted from the oestradiol-17β concentration of the conceptus culture media supplemented with testosterone, before statistical analysis. Although it was possible to allocate the conceptuses to one of three morphological classes (microscopic, macroscopic and elongated), within each size class there was a continuous distribution of conceptus sizes and obvious within litter variability. To allow comparisons between the oestradiol-17β secretion of blastocysts cultured at different stages of morphological development (individual versus mixed tissue cultures) the DNA content of the tissue in each culture dish at the end of the incubation period was measured . From the DNA concentration of each culture, the number of cells in each conceptus or mixed tissue culture was calculated (assuming that each porcine cell contains 5 pg DNA) and used as a denominator for the expression of oestradiol-17β secretion [26, 27]. The inter-assay coefficient of variation was 14.91%, as determined by measuring multiple aliquots of calf thymus DNA. All data were analysed using the Genstat 5 statistical package (Genstat 5 release 3.1; Genstat 5 Committee of the Statistics Department, Rothamsted Experimental Station, Harpenden, Hertfordshire, UK). Oestradiol-17β secretion was expressed per culture (pg) and per 1000 cells (pg/1000 cells) to standardise results from individual conceptuses and pooled cultures for the purposes of statistical analysis. Where the oestradiol-17β content of the cultures was below the minimum detectable dose of the radioimmunoassay a constant positive value was assigned to allow loge transformation of the data and to reduce the influence of the zero values on the interpretation of the results. Data were tested for Normal distribution and transformed if necessary, to overcome scale effects. Where such a transformation was inadequate for stabilising the data, rank values were assigned and non-parametric analyses were applied. The appendices of Fowler and Cohen (1990) were referred to for additional statistical tables. Results presented are arithmetic means and the associated standard error of the mean (mean ± s.e.m.). The threshold value for regarding differences as being significant is P < 0.05, unless otherwise stated. Relationships between variables were analysed by Product Moment and Spearman rank correlations, and causal effects investigated by simple and multiple linear regression. Kruskal-Wallis analysis or analysis of variance was used to compare the different days of pregnancy, using individual animals to provide a block structure when multiple observations were made for each gilt. The stepwise regression facility of the Genstat 5 package was used to generate an optimal model which accounted for the variance in oestradiol-17β secretion, using day of pregnancy, number of cells, conceptus surface area or tissue wet weight and the presence of testosterone in the culture media as explanatory variables. Interactions between variables were also included in the analysis. The morphological stage of development and oestradiol-17β secreting ability of the conceptuses recovered on each day of pregnancy studied are summarised in Table 1. Mean ovulation rates and the numbers of individual conceptuses recovered at surgery are reported in Table 2. The mean ovulation rate on day 15 after the onset of oestrus was 19.2 ± 1.07 (N = 5 gilts). Ovulation rate and the number of individual blastocysts recovered were positively correlated (P < 0.05) on days 11, 12 and 13. Number of conceptus cultures prepared for each of the three stages of morphological development recovered on days 11, 12, 13 and 15 after the onset of oestrus (numbers in parentheses indicate the number of cultures secreting measurable quantities of oestradiol-17β). a Each culture contained a single blastocyst. b The number of individual blastocysts in this category could not be determined; cultures were prepared from mixed conceptus tissue. Mean ± s.e.m. number of ovulations and individual embryo recoveries from Meishan gilts on days 11 to 13 after the onset of oestrus. a N = 6 gilts per day. b day 11, N = 6 gilts; day 12, N = 5 gilts; day 13, N = 1 gilt. c The only litter with individual conceptuses had an ovulation rate of 20. Conceptus oestradiol-17β production in vitro was investigated in 249 cultures (N = 184 individual blastocysts and N = 65 mixed filamentous tissue cultures), which were equally distributed between the control and testosterone treatment groups with respect to the number of cells per culture, and surface area or wet weight (where measured; P > 0.05). Thus, treatment differences in oestradiol-17β production by cultures of similar morphological stage of development could be attributed to the presence of testosterone in the culture medium. Tissue wet weight and blastocyst surface area, when recorded, were positively correlated with the median number of cells per culture (P < 0.01), and the surface area of macroscopic spherical blastocysts increased logarithmically from days 11 to 13 after the onset of oestrus (P = 0.038). When data for all three morphological categories were pooled, the median number of cells per culture depended on the day after the onset of oestrus on which the conceptuses were recovered (P < 0.01, see Figure 1). Number of conceptus cells in culture on each day studied. Mean ± s.e.m. number of Meishan conceptus cells in culture on all days of pregnancy studied. (a) Individual microscopic and macroscopic blastocysts. (b) Mixed conceptus tissues. Effect of day: P < 0.001 in both analyses. (Control (testosterone free) cultures blue bar; testosterone supplemented cultures wine bar.) The number of cultures per treatment group is shown above each bar. Seventy-four cultures contained less oestradiol-17β than the minimum detectable dose of the radioimmunoassay. Spearman rank correlations demonstrated that oestradiol-17β production was positively correlated with the number of cells in each culture (P < 0.01; Figure 2), regardless of day or testosterone supplementation. An increase in blastocyst surface area was also accompanied by an increase in the oestradiol-17β content of the culture media (Product Moment correlation of loge transformed data; P < 0.01), but no significant relationship between oestradiol-17β secretion and conceptus tissue wet weight was observed in mixed tissue cultures. Correlation between the number of cells and oestradiol-17β content of each culture. 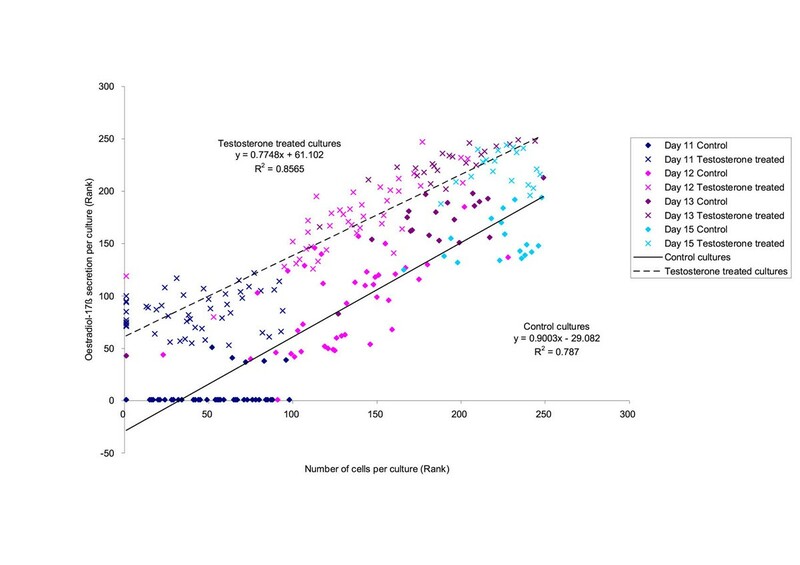 Correlation between the rank of the number of cells per culture and the rank of the oestradiol-17β content of the culture media, with --- and without — testosterone supplementation, for all conceptus cultures. Adding testosterone to the culture medium increased conceptus oestradiol-17β secretion per culture and per cell (P < 0.001), when all data were considered together. This effect was conserved when the data were analysed separately, by day or morphological class (microscopic, macroscopic or elongated blastocysts). However, on day 11 after the onset of oestrus, only 16 of the 88 blastocysts cultured (18.2%) were secreting enough oestradiol-17β to exceed the minimum detectable dose of the radioimmunoassay. Of these 16, only five control (testosterone-free) cultures generated detectable levels of oestradiol-17β. All of these were recovered from one gilt; three other control cultures from the same animal did not secrete detectable quantities of oestradiol-17β. From the same gilt, four of the eight testosterone-supplemented cultures also contained measurable oestradiol-17β although the mean oestradiol concentration of these cultures (26.96 ± 17.46 pg) was not significantly higher than that of the control cultures (25.91 ± 8.80 pg). Of the 7 remaining testosterone-supplemented cultures that contained oestradiol-17β on day 11, two contained oestradiol-17β concentrations that were not statistically different from the minimum detectable dose of the assay (7.5 pg ml-1). After day 11, all but one conceptus cultured in isolation were secreting measurable quantities of oestradiol-17β. When all cultures were considered together, day of conceptus recovery, the effect of testosterone supplementation and their interaction accounted for 74.2% of the variance in loge oestradiol-17β secretion when expressed per cell (Stepwise regression analysis; P < 0.001). The mean oestradiol-17β secretion of the individual conceptuses collected on days 11, 12 and 13 after the onset of oestrus and cultured either with or without additional testosterone is presented in Figure 3. 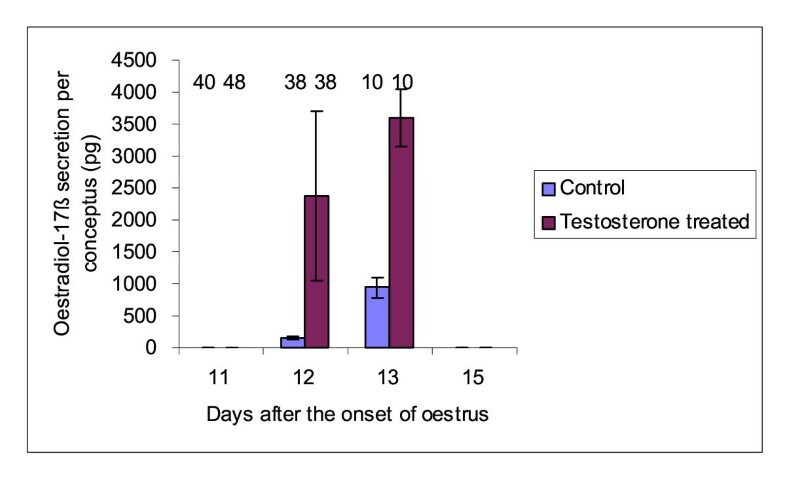 Figure 4 shows the effect of testosterone on the secretion of oestradiol-17β, expressed per 1000 cells, on each day of pregnancy studied. Conceptus oestradiol-17β secretion in the presence or absence of testosterone. Mean ± s.e.m. oestradiol-17β secretion by individual conceptuses cultured with and without supplemental testosterone. (Control (testosterone free) cultures blue bar; testosterone supplemented cultures wine bar.) Effect of day: P < 0.001. Interaction of testosterone and day: P < 0.001. The number of cultures per treatment group is shown above each bar. Oestradiol-17β secretion per conceptus cell on each day studied. Mean ± s.e.m. in vitro oestradiol-17β production per conceptus cell, with and without testosterone supplementation. Data from individual and mixed conceptus tissue cultures prepared on the same day after oestrus have been pooled. (Control (testosterone free) cultures blue bar; testosterone supplemented cultures wine bar.) Effect of day: P < 0.001. Interaction of testosterone and day: P < 0.001. The results of this experiment support the hypothesis that Meishan conceptus oestradiol-17β secretion is temporally determined, and independent of the stage of morphological development of the conceptuses recovered. These data also demonstrate that the onset of oestradiol-17β secretion in this breed is limited by an inability to synthesise oestradiol-17β from its precursors, as observed in domestic pig breeds . Although it was possible to allocate the conceptuses to one of three discrete morphological classes (microscopic, macroscopic and elongated), within each size class there was a continuous distribution of conceptus sizes and obvious within litter variability. Nevertheless, once oestradiol-17β secretion had commenced within a litter, all conceptuses produced this steroid, irrespective of their size. Previously, we have observed that Meishan conceptus oestradiol-17β secretion was absent before day 12 after the onset of oestrus . Despite recovering both microscopic and macroscopic conceptuses on day 11 after the onset of oestrus in the study reported here, only a low percentage were secreting oestradiol-17β in vitro. Furthermore, testosterone supplementation failed to increase the output of oestradiol-17β by day 11 conceptuses in vitro, when compared with control cultures. Although fewer microscopic conceptuses were recovered on day 12 than day 11, testosterone supplementation on day 12 and thereafter, resulted in an increase in the oestradiol-17β content of the conceptus culture media compared to control conceptuses cultured without testosterone. In contrast, we have previously reported that 54% of Large White x Landrace conceptuses collected on day 11 after the onset of oestrus are capable of secreting oestradiol-17β in vitro, but only 31% of the Large White x Landrace conceptuses recovered on day 12 produced measurable quantities of this steroid . In the experiment reported here, conceptus recovery was timed relative to the first day of standing heat rather than the time of ovulation, as there were no facilities available to determine when ovulation occurred precisely. As the time of ovulation can vary relative to the onset of standing heat , it is possible that the gilt which produced the litter of conceptuses capable of secreting oestradiol-17β on day 11 may actually have been at a more advanced stage of gestation than the other gilts in this experiment or our previous study . Conceptus oestradiol-17β secretion invokes changes in the uterine secretory activity, which may compromise the ability of less developed conceptuses to survive [29, 30]. Cytokines and protease inhibitors are known to be released from the endometrium , which may aid the adhesion of the elongating conceptuses to the uterine epithelium. On day 12, Meishan conceptuses at all stages of morphological development were recovered, and all except one culture contained measurable quantities of oestradiol-17β. This suggests that Meishan conceptuses that are less morphologically developed are nevertheless at an equivalent stage of biochemical development with regard to their ability to secrete oestrogens. Therefore, it is likely that they also possess the capacity to adjust their metabolism to the associated changes in their uterine environment, hence remaining viable during this period of change. The expression of RNA encoding cyclooxygenase-2, the rate limiting enzyme in prostaglandin synthesis, has also been shown to vary with the stage of morphological development of domestic pig conceptuses . It remains to be determined whether the expression patterns of this enzyme are similar in Meishan conceptuses. To justify comparisons of these results with published data the basic parameters of conceptus viability for the gilts studied in this experiment were examined. Their mean ovulation rate was similar to that previously reported for this population of Meishan gilts . Furthermore, we observed no significant decline in the percentage conceptus survival between days 11 and 13 of pregnancy, when considerable conceptus mortality is reported for domestic pig breeds. Similar observations have been reported in other studies where individual Meishan conceptuses were examined [3, 8, 32, 33]. Thus, we have assumed that the Meishan conceptuses studied during this investigation were representative of those used in comparative studies in our laboratory [8, 12]. Testosterone was selected as the substrate for oestradiol-17β biosynthesis in this experiment as it is metabolised directly to oestradiol-17β by aromatase, without conversion to intermediate metabolic products . However, this in vitro analysis does not allow conclusions to be drawn about the activity of enzymes higher up in the biosynthetic pathway of oestradiol-17β. Cytochrome P450 17α-hydroxylase (17α-hydroxylase) expression in Meishan ovarian follicles has been shown to exceed that of the Large White . This cytochrome is thought to be responsible for the increased oestradiol-17β production by Meishan follicles compared with the Large White, by increasing the availability of androgens for metabolism. Temporal differences in 17α-hydroxylase expression in Meishan and Yorkshire conceptuses exist . In domestic pigs this enzyme is believed to be rate limiting for the secretion of oestradiol-17β by conceptuses , and breed differences in its expression correlate with the oestradiol-17β content of conceptuses greater than 4 mm in diameter . Although the temporal expression of this enzyme differs between the breeds its expression is maximal on day 11.5 after the onset of oestrus in both Meishan and Yorkshire gilts. It could, therefore, be speculated that 17α-hydroxylase activity limits the oestradiol-17β output of Meishan conceptuses after day 12 of pregnancy, by restricting the availability of androgens for metabolism to oestrogens. However, the evidence of this and other studies  suggests that uterine luminal fluid testosterone could also be used as a substrate for oestrogen production in vivo, and therefore aromatase activity should also be considered important for oestradiol-17β production. Breed differences in aromatase activity between Meishan and Yorkshire conceptuses less than 6 mm in diameter also exist . Low levels were measured in the Meishan on day 11 and had increased by day 11.5, but never achieved the levels recorded for Yorkshire conceptuses. It can be hypothesised, therefore, that adequate levels of combined steroidogenic enzyme expression and maturation of the secretory mechanisms for oestradiol-17β determine the time of onset of conceptus oestradiol-17β, and that these events differ temporally between Meishan and domestic breeds. Two waves of conceptus oestradiol-17β secretion are required for the establishment of pregnancy in domestic pig breeds; the first between days 11 and 12 and a second after day 14 after the onset of oestrus . Biphasic conceptus oestradiol-17β secretion has not been reported for the Meishan, but may occur. 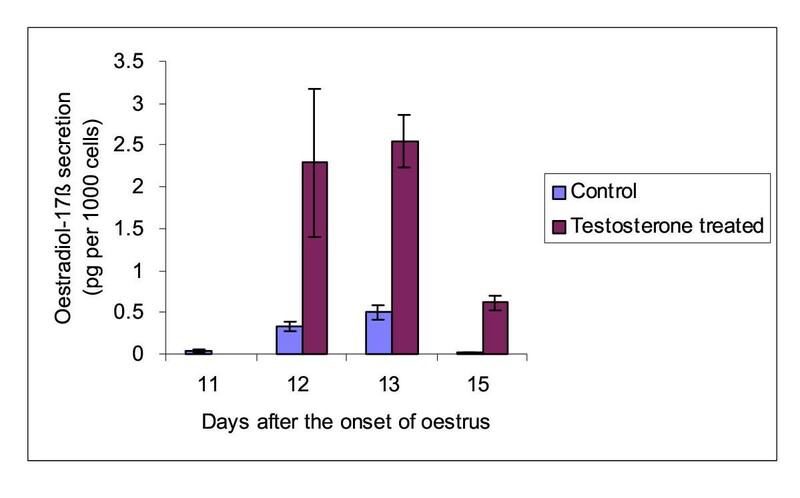 In the present experiment, the oestradiol-17β secretion per 1000 conceptus cells was lower on day 15 after the onset of oestrus, in both testosterone supplemented and control cultures, than on day 12 or day 13 of pregnancy (see Figure 4). Correcting for differences in the number of conceptus cells per culture, it appears that the total output of a Meishan litter on day 15 is intermediate, between that of day 13 (highest total litter output) and day 12 conceptuses. Without data from conceptuses recovered on day 14 it is not possible to determine whether conceptus oestradiol-17β output is declining or increasing on day 15. However, between-breed differences in the timing, and possibly the pattern of oestradiol-17β secretion may be important for the increase in conceptus survival seen in Meishan compared to domestic breeds. The results of this study indicate that temporal synchronisation of biochemical development exists for Meishan conceptuses, and could be important for conceptus survival in this breed, helping it to achieve its prolificacy. The primary limiting factor for controlling this mechanism is the activity of aromatase enzymes, as the provision of exogenous substrate for metabolism fails to stimulate conceptus oestradiol-17β secretion before day 12 of gestation. A., R. and C. Simpson, the late C. White and K. Pennie are thanked for animal care and assistance during surgery and slaughter procedures. Statistical advice was received from Drs. M. Franklin, C. Harbron, and Miss K. Robertson. Radiolabelled oestradiol-17β and antiserum were gifts from Prof. S. Hillier (Regional Endocrine Laboratories, Edinburgh) and Dr. J.M. Wallace (RRI), respectively. Financial support was received from the Scottish Executive Environment and Rural Affairs Department; ARP received the Sir Kenneth Blaxter studentship, awarded by RRI. Grateful thanks go to Dr. T. G. McEvoy (SAC Aberdeen) for helpful comments on the content of this manuscript.